Let's Play Makeup: Bye Bye Blemishes! As I have mentioned before my face this past semester had been breaking out ALOT. Over Christmas break, however, I came across a few things that helped clear up my skin so much and I wanted to share what has been working for me the past month in case you share the same frustration. So, here is my current skin regimen! First: I take my makeup off EVERY NIGHT which is SO important to do. Plus my mascara irritates my eyes every time I sleep in it. Since visiting Japan I've been using cleansing oil to take my makeup off. So I bought this one to bring back with me, the cleansing oil is nice and moisturizing and does a GREAT job of taking off all your eye makeup, even waterproof! Second: I take me new found acne secret Lush's coalface cleanser and wet my face and the soap bar and then rub the bar between my hands to get it kind of sudsy. This bar is for oily to combination skin and is a mild exfoliate. It's also preservative free and has no animal products of any kind in it for all the vegans out there! If you go to the link above the website shows you ALL the ingredients, which I love. I use this in the morning and at night. Third: After I have spread the coalface all over my face I use my lovely new Clarisonic Mia 2 brush that I got for Christmas to get an extra deep clean. I have never felt my face feel as clean as it does after using these two products together. The clarisonic really gets into the pores and cleans it all out, and does a great job of getting all the makeup off at night. (I've also noticed that my makeup goes on much smoother) If it's too rough on your skin using it twice a day, I would recommend maybe using it only at night where you can get all your makeup and yuck from the day off - then just use your hands to wash in the morning. **I know this is very expensive, so if you're looking for a more price friendly version to try out first, I would recommend Olay's version which is $29.99 vs. over a $100. I tried this first to see if I liked using this kind of method to wash my face and really loved it as well. Fourth: I then dry my face and use a cotton ball to apply some toner. I use Boots organic face rosewater toner. I love this toner because it's gentle on the skin and non-drying but it still removes any last traces of makeup/junk from your face and leaves your skin fresh with a lovely light rose scent. It's also super affordable for the nice quality of the product. *You can get this at the bookstore if you're on UD's campus, Target or the website it linked above. Fifth: To finish I apply some moisturizer all over my face. It's important to keep your skin moisturized for healthy looking skin. Even if you have oily skin or combination skin like me, I use Mary Kay's oil free hydrating gel. I love this product so much because it hydrates my face without feeling heavy like some creams can do to my skin. For Spot Breakouts: I use Kate Somerville's EradiKate Acne Treatment. It's a drying lotion and I use it on pimples that pop up in spot around my face. All you have to do is taken a clean Q-tip and dip it in (making sure you get the sediment at the bottom) and then dab away on those suckers. (I sometimes look polka doted I use so much) I put this on at night after I do all the steps above, let it dry then sleep with it on my face, then in the morning wash it off and either gently pop the pimples (even though I know you're not supposed to hence the reason I said gently) or sometimes they have gone down so much they go away. 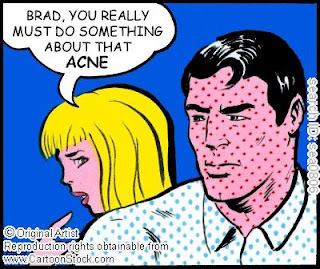 * A useful tip on popping pimples: A makeup artist for beauty pageants once told me to take a clean washcloth and run part of it under really hot water. Then put it on the pimple like a little steam mask to get it ready to pop (of course it has to sorta be ready to pop before you do this) then use the washcloth to simple 'rub away' the pimple instead of using your fingers to pop. I think this is usually less painful, so I thought I would share! Of course some pimples you just have to get down and dirty with, but hopefully this works for most! I hope that maybe you can try some of these things and they work for you too! Comment below and let me know if you already have or any tips that you may have that you use on your own skin AND any ideas on what you want me to blog about next! Follow me for a post soon on cool beauty items I got from my trip to Japan! I have recently been taking extra care of my face and trying to be extremely disciplined with my beauty regimen. Thanks for the tips and product recommendations. Glad you enjoyed them! These products really work for me! Taking care of your skin is so important - the better your skin, the less foundation you have to worry about! thanks for commenting! I love oil cleansers! I'm so glad when other people talk about them and how they work for all skin types(so I don't sound like a broken record), and I also like the Boots toner, their skin brightening one is nice as well. I like them because I don't feel like i'm tugging at my eyelashes when I use them. I appreciate the comment!